Question: How Can I Filter Hot Water? The other day we received an email from ErnieB_121 who had a question about filtering hot water before use in his restaurant. Thank you very much, Ernie, for a colorful email. Ha ha. We can totally understand your frustration with having to replace hard-to-reach inline filters. We believe you may find a filter housing and filter for your application at WaterFilters.Net, an online retailer of commercial and residential water filtration products. When last we checked they carried three different styles of housings for hot water filters and a good assortment of filters to go in them. One thing you failed to mention Ernie… Where does the residue clogging your lines come from? What does it consist of? Calcium? Iron? Manganese? Radioactive sludge from the planet Mars? Not poking fun at you, just trying to make a point: you need to test your hot water — after it cools — and find out what sort of deposits you have so you can purchase the correct filter for your needs. As with any water quality investigation, if you have reason to suspect contamination of your water supply with potentially harmful compounds and/or chemicals, we highly recommend having your water tested by a certified water testing laboratory such as National Testing Laboratories. Though designed to protect the environment and everything in it, sometimes environmental laws fall short of that goal and actually allow very bad things to happen — such as the unlimited discharging of wastewater containing dissolved metals, and probably several other environmentally unsafe things, from a power plant in Tennessee into the Clinch River. WASHINGTON (Dow Jones)–Environmental groups on Thursday took aim a Tennessee Valley Authority power plant that was responsible for a toxic spill last year, challenging a new permit allowing the plant to dump unlimited amounts of additional pollutants into Tennessee’s Clinch River. Earthjustice, Environmental Integrity Project and the Sierra Club filed the appeal before the Tennessee Water Quality Control Board. It challenges a permit granted last month by the Tennessee Department of Environment and Conservation, or TDEC, that allows the TVA to discharge pollutants into the river. Power plants dump dirty water into rivers in part because of technology to keep soot and ash out of the air. But if the waste is pumped into waterways without being treated, the mixture of water and metals can damage drinking-water supplies and the environment. State are largely responsible for regulating the discharges. “What we’re seeing on the whole is cleaner air but dirtier water,” said Abigail Dillen, a lawyer with Earthjustice. She said the TVA’s Kingston plant was “not taking the additional steps they need to take to treat their wastewater,” since state environmental regulators hadn’t required it. 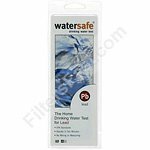 Situations like this make all of us at Water Testing Blog glad the public has access to test kits for metals in drinking water that provide rapid test results for things like copper, iron, manganese, chromium, and lead. For a more general test of the metals content of water, people can also use a product such as SenSafe Water Metals Check to get a semi-quantitative reading of the total metals content of well water, tap water, groundwater, etc.